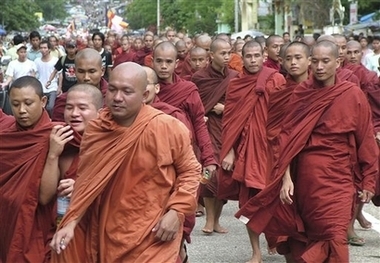 YANGON, Myanmar - As many as 100,000 anti-government protesters led by a phalanx of Buddhist monks marched Monday through Yangon, the largest crowd to demonstrate in Myanmar's biggest city since a 1988 pro-democracy uprising that was brutally crushed by the military. From the front of the march, witnesses could see a one-mile stretch of eight-lane road was filled with people. Some participants said there were several hundred thousand marchers in their ranks, but an international aid agency official with employees monitoring the crowd estimated said the size was well over 50,000 and approaching 100,000. The BBC World Service had an excellent piece of reportage about the monks on yesterday, if you can find.